Audio recording utility is becoming more and more popular among the users, as it procides a convenient process for the users to get the music files they need without searching on the Internet again and again. The best professional audio recorder software will help users to record audio files without any effort, and it may also provide the functions of converting recorded music files to compatible file types. Moreover, the best professional audio recorder will help users to save the recorded audio files to their local hard drive so that the users can get access to the recorded files easily. The recorded audio is usually saved in .mp3 file extension but if you have the best professional audio recorder, you don't have to convert the music files manually. This post will introduce the best professional audio recorder programs in detail, which may help you to learn more about the audio recording software. iMusic is regarded as the best professional audio recorder because it offers great features for the users to download and record music, so that the users can get any music files they want with ease. iMusic is a good choice for the people who want to get music from the online music sharing sites, or extract audios from other resources. 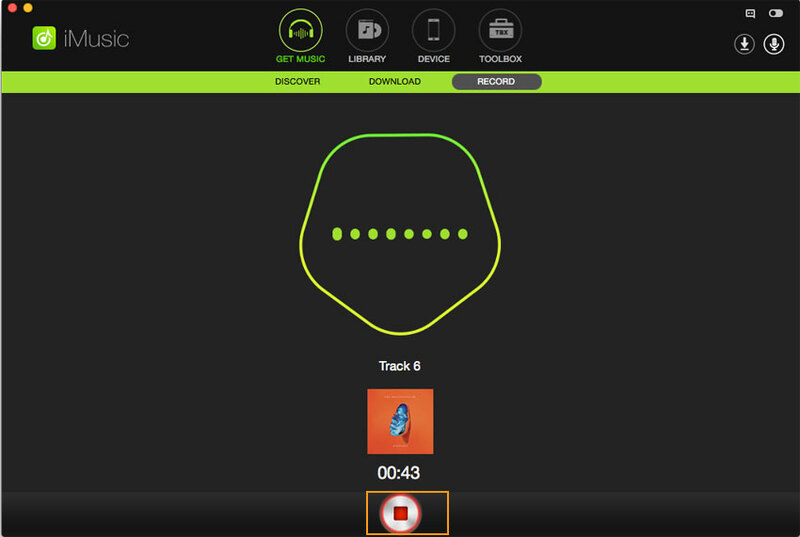 This section will introduce the key features of iMusic and how to use it to record audio files on your computer. 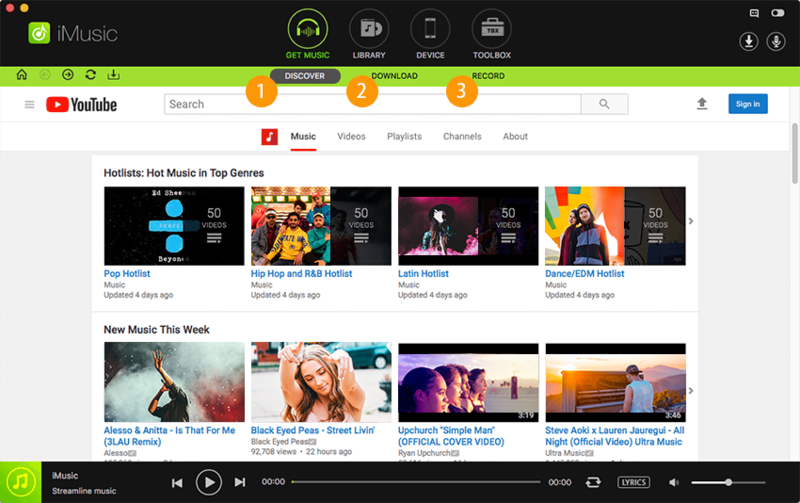 iMusic allows the user to get access to 10000+ sites for recording audios professionally. The users don't have to face any complications as the user interface is very easy to use. The users can transfer the recorded tracks to their mobile devices for offline enjoyment. 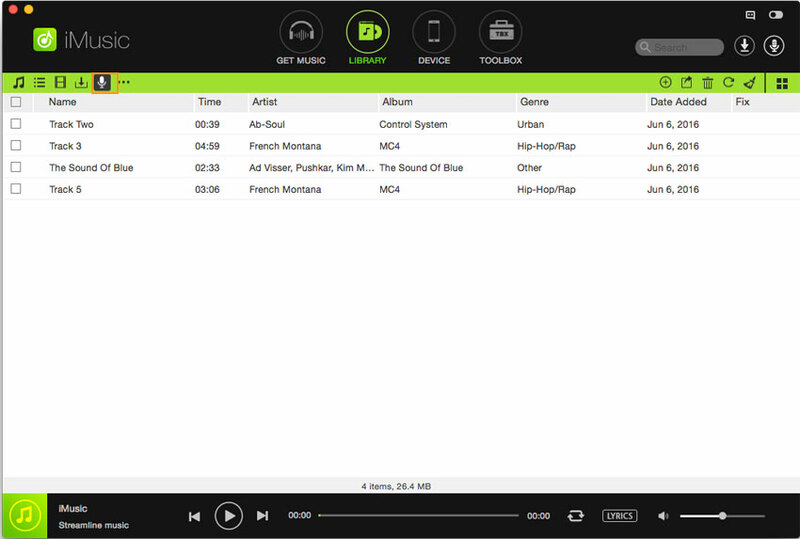 The program will save the recorded music files into its music library, and the users can see the recorded music files easily. iMusic allows users to fix their music library with one click. This professional audio recorder enables users to manually edit the music tags easily. The program will automatically convert the recorded audio files to MP3 files during the recording process. 1. iMusic is a superb tool that offers a healthy set of features, but for long-suffering iTunes users, there is one killer element to this: the ability to recover your iTunes library after a disaster. So, if your PC or Mac dies or inexplicably deletes your library, iMusic will repopulate your library, almost as if it had never been lost. 2. One nice feature of iMusic is its ability to clean your library and put the proper labels and tags to your individual music file. It worked nicely on my files as they became more streamlined and properly labeled after I run the cleaning function. Start iMusic on your computer after the installation. Then you'll see the interface of discovering music in this professional audio recorder. Choose the RECORD option at the top middle of the software window, and click the Record button at bottom to let the program stand by. Now you can play the music files you need, and the program will record the files. Note: You need to click the Record button before playing the music, so that the program can record the complete music info. When the file finishes playing, you can click the Record button again to stop recording. Then you can click the microphone icon at the upper right corne rto view the recorded music. With the help of this professional audio recorder, the users can record any audio file they want with no efforts. The program will bring much convenience to the daily music life of the music fans. The professional auido recorder programs for desktop users are large in number on the Internet. Most of the programs provides more functions than only recording. However, many users don't want to use the offline programs as they think the programs are complicated. When they surf the Inernet and want to find the best professional audio recorder online, they will find a lot of results. These online audio recorders are easy to use, and only provide the recording function. But they also have certain limits, such as the time limit, size of the recorded file and so on. This part will introduce one of the online audio recorders, OnlineVoiceRecorder.com, to the users who only want to record short-time audio files. Go to the website, and you can see several options in the menu bar. Choose Voice Recorder and you can see the window of recording music. Click the Record button at the left side, and the recorder will start working. Now you need to play the audio file, and the program will record it. 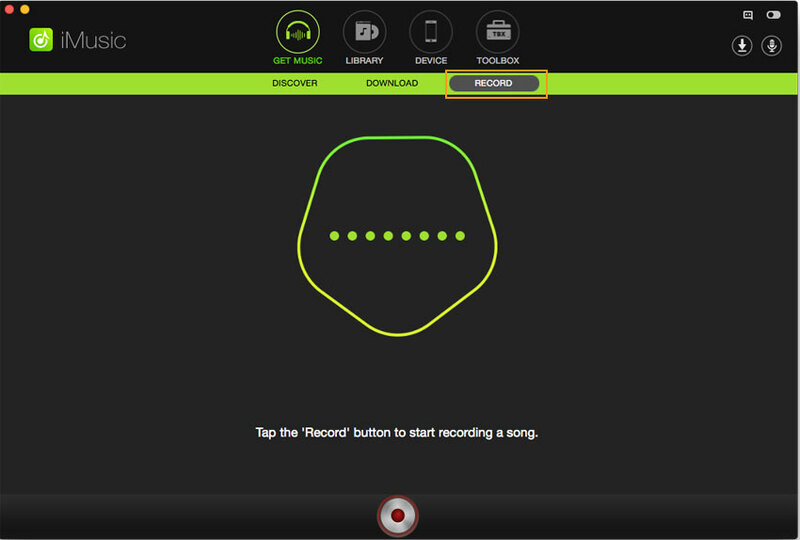 If this is the first time you use this online recorder, the site will ask for permission to use the microphone on your computer. Click the Record button again to stop the recording process. After clicking the Record button, you can see a Save button at the right side. Click the Save button, and the site will get the recorded files ready for saving. Then you'll see a Click the Save button at the right side. Click the button and choose a target folder on your computer to save the recorded files. Wondershare Streaming Audio Recorder is another professional audio recorder, and it gives the user an access to audio recording from any online source as long as the audio is playing. This audio recorder provides a simplified user interface, and several helpful functions which helps users to record any audio file they want, and save the recorded audio files to their local hard drive. This part will introduce the key features of this program, and how to use it to record audio files. 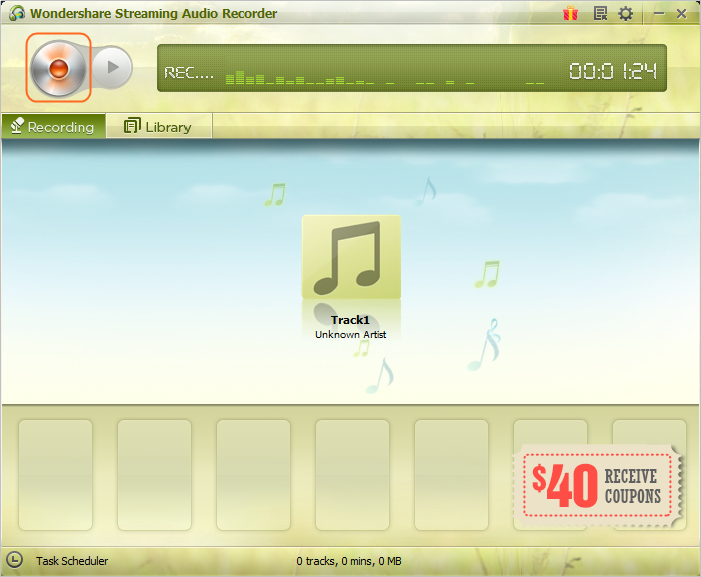 Wondershare Streaming Audio Recorder allows the user to record music from any online music resource. 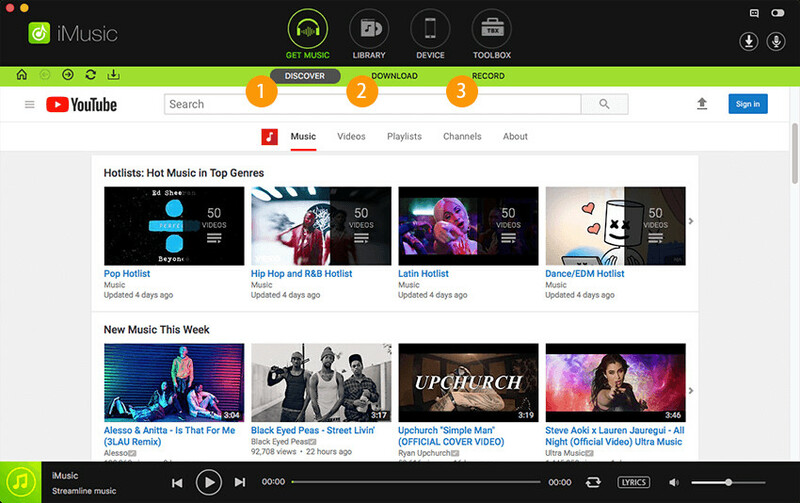 More than 10000 music and video sites are supported by this program. Wondershare Streaming Audio Recorder also allows the user to record chats from Skype or other such audio chatting software applications easily. This professional audio recorder will save the recorded files to its music library. There is a ‘make ringtone’ feature in this software, which allows the user to select a recorded track and make it a ringtone. The tracks recorded on Wondershare Streaming Audio Recorder are free from virus and malware. The recording experience on this software is totally ad-free as the Advertisement Removal feature helps the user get rid of all the disturbing pop-up ads. 1. Ridiculously easy to use....Worth the price! 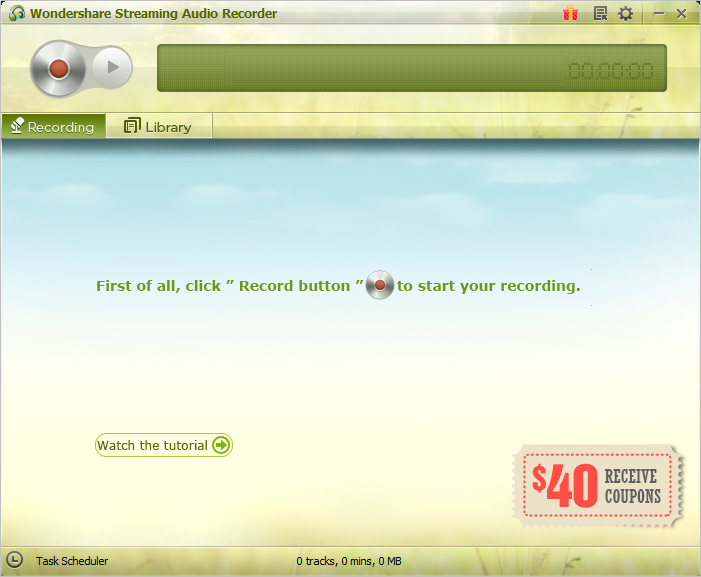 :I had spent half a day looking for an audio streaming recorder and found nothing but frustration. Several programs contained malware and crashed my pc to boot...even from reputable sites. I am so happy I found this program. It does exactly what I need it to do and it WORKS. No settings, no timing. You just press record and it records all by itself. Didn't even read instructions. No malware, spyware, stupid toolbars. Can't beat that. 2. Wondershare Streaming Audio Recorder Review: Now that I have Streaming Audio Recorder, I can capture HD quality music directly from my favorite new and classic YouTube videos, no matter how obscure. No more searching for some artist late into the night. I know YouTube has everything and now I do too! 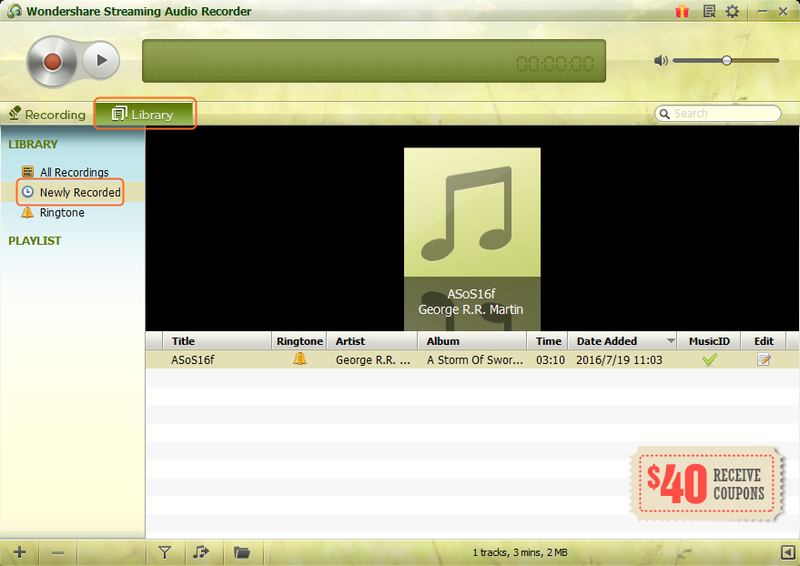 Download and start Wondershare Streaming Audio Recorder, then you'll see the main interface of recording audio. Click the Record button at the upper left corner, and the program will get ready for recording. Now you can play the audio file you want, and the program will record it. When the audio file finishes playing, you can click the Record button again to stop recording. The program will save the recorded files to its music library, which allows you to view by choosing Library, and selecting the Newly Recorded playlist. Conclusion: The three mentioned professional audio recorder programs are all helpful for recording music files on your computer. When you make a comparison among these three programs, you can find out that iMusic provides you a better using experience. If you are interested in this program, just free download it and have a try.